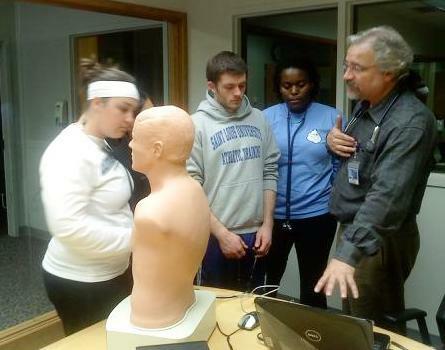 Dr. Tyler Wadsworth, the Medical Director for the SLU Athletic Training Education Program, conducted a lab with some of the students in the College of Medicine's Simulation Lab. This is a part of the class MAT 580: Medical Conditions in Athletic Training. 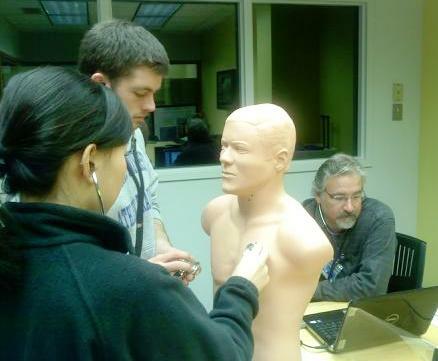 They listened to normal and identified abnormal heart and lung sounds using the state-of-the-art SAM practice manikin. This is yet another advantage of being housed on the Health Science Campus at SLU. 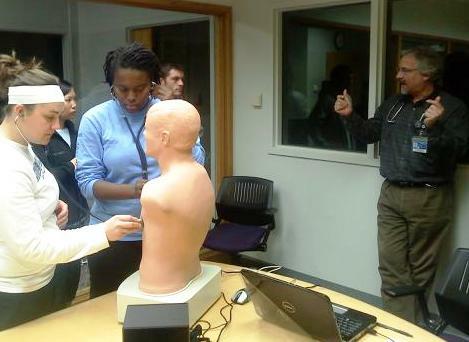 Dr. Wadsworth introduces the SAM manikin to the students. Dr. Wadsworth creates a scenario while Leah Egeland and JJ Hannigan listen to it. Kacey Morrison and Kemba Noel-London get valuable practice identifying rare, abdnormal heart and lung sounds.